Grand Junction– On the heels of WCCC graduating the first cohort of viticulture and enology graduates, the program collected numerous awards during the Colorado Association for Viticulture and Enology (CAVE) annual trade show and conference in Grand Junction, Colorado. Program Instructor Jenne Baldwin-Eaton was named “Friend of the Colorado Wine Industry” by the association. The award is among the association’s most esteemed recognitions. 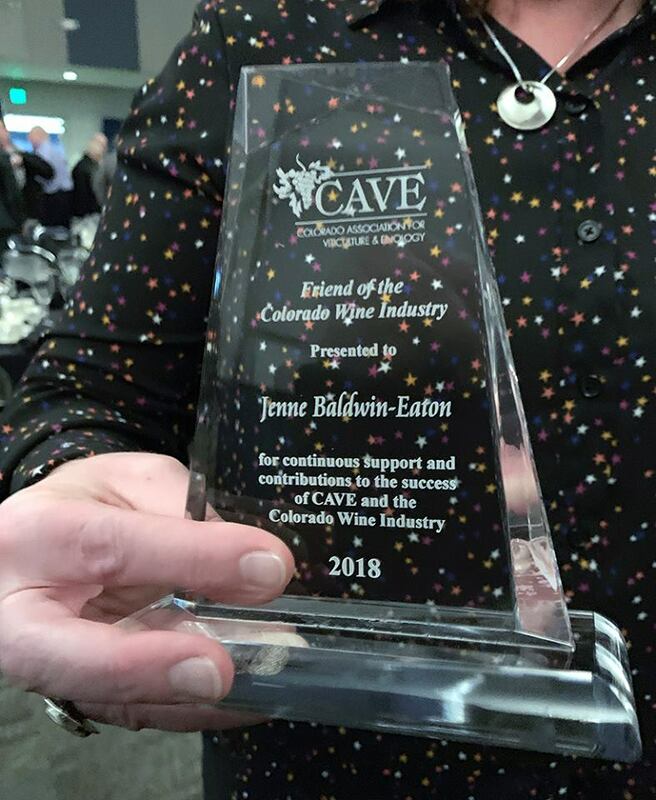 “Jenne has worked tireless not only to perfect her own craft but has gone to great lengths as an instructor and as an artisan to advance the interest of viticulture and enology in Colorado,” said Cassidee Shull, CAVE executive director. WCCC students won a litany of medals in the 2018 Amateur Winemakers Competition. Kathleen Ondrus received the highest marks raking in two double gold medals, five gold medals, four silver medals and three bronze awards. Additional students to acquire association awards for their wine included Eric Hanby, Sarah Steele, Amy May Gekas and Rick Lanoue. Baldwin-Eaton’s award was a result of her work in the local wine making industry that has spanned more than 22 years. Baldwin-Eaton feels good about making an impact on improving the quality of grapes in the region. Improved grape quality has allowed for improved wine and a thriving industry. In fact, the Grand Valley is home to more than 30 wineries and Mesa County grows nearly 92 percent of Colorado’s grapes. Vice President of Community College Affairs Brigitte Sundermann congratulated Baldwin-Eaton on the accomplishment. The WCCC viticulture and enology program community advisory board is currently seeking community support for scholarships, sponsorships and programmatic investments. For more information about the program or student and instructor awards visit, coloradomesa.edu/wccc/programs/viticulture.